With a two week engagement at San Francisco’s Palace of Fine Arts theater, Smuin Ballet has kicked-off their twentieth anniversary season. The company has never looked better – the familiar faces are as solid as ever and they have been joined by some exciting new company members. “XXtremes” is all about contemporary ballet, a triple bill featuring Amy Seiwert’s “Dear Miss Cline”, Jiří Kylián’s “Return to a Strange Land” and Michael Smuin’s “Carmina Burana”. “XXtremes” runs until Saturday – don’t miss your chance to celebrate this important moment in Smuin Ballet’s history. 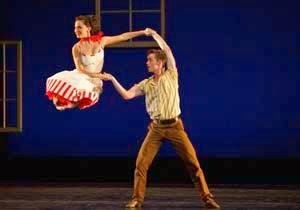 A nostalgic period ballet, “Dear Miss Cline” is choreographer-in-residence Amy Seiwert’s tribute to the music of Patsy Cline. When it premiered two years ago, it became an instant fan favorite, though it wasn’t particularly a favorite of mine. However, this time around, “Dear Miss Cline” was fun and springy; just delightful. This goes to show that casting really matters. A few of the cast members were the same as during the world premiere, but the injection of some new blood was vital. It gave “Dear Miss Cline” a buoyant energy and youthful presence that was definitely missing two years back. Jonathan Dummar had the performance of a lifetime on Saturday evening. Whether arabesque, attitude or a traditional pirouette, his every turn finished up in the turning position rather than down on the floor. You often talk of dancers soaring in jumps, but Dummar truly soars in his turns. And though “Dear Miss Cline” is a group piece, new company member Nicole Haskins shone in her slightly more prominent role. Terez Dean and Christian Squires in "Dear Miss Cline"
Jiří Kylián’s “Return to a Strange Land” is a new work for Smuin Ballet, though it was originally choreographed in the mid-1970s, two years after the death of choreographer John Cranko. A work dedicated to Cranko, “Return to a Strange Land” takes its cast of six through four separate contemporary ballet movements, each conveying a distinct emotional quality. The first movement was full of motion and swirling, like getting lost in a sea of information. Next came a variation full of abandon yet marked by an underlying notion of mature restraint. The third duet was about falling, punctuated by quick staccato boureés and last, Kylián created a mirage of living sculpture. Bodies morphed from one state to another; some images were subtle (a flick of the wrist) and some were dramatic (the extension of the entire body). Closing the “XXtremes” program was Michael Smuin’s 1997 masterpiece “Carmina Burana”. With 2013 being the “The Rite of Spring’s” hundredth anniversary, dance patrons have certainly been treated to their fair share of ritualistic drama over the course of this year. “Carmina Burana” is something different altogether, but there is that sense of hypnotic ritual to it, with the presence of the crowd and the chosen one. Smuin’s “Carmina Burana” definitely has a strong narrative (more so than many of his lyrical ballet works), but the real triumph with this piece is how Smuin married the complex score with appropriately complex movement. And performance-wise, the men’s trio (Ben Needham-Wood, Aidan DeYoung and Eduardo Permuy) stole the show – their unison was otherworldly. While “XXtremes” brought together three diverse choreographic works, there were some problems with structure and repertory choice. First was the program order. Smuin’s “Carmina Burana” is an epic piece, quite long and with a dynamic level doesn’t vary that much. It would have made more sense for it to open the program rather than close it. Second, each ballet featured in “XXtremes” had a similar compositional form. All three were made up of smaller scenes/vignettes, each with their own defined beginning and ending. On its own, this structure is tricky; small individual snippets can make it difficult to maintain forward momentum and choreographic continuity. It can feel too much like a ‘stop and go’ experience, and not enough like a comprehensive work. However, this type of formal structure can also be completely successful. The issue here was not the individual variation style but that every piece on the “XXtremes” program had this characteristic. When celebrating the breadth of a ballet company, at least one of the repertory choices might have reflected a different formal structure.